My name is Veronica Reinstein. I am pianist and live in Stockholm, Sweden. I was born in Moscow, USSR. 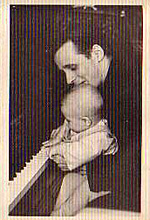 Both my parents were musicians and I started playing piano at the age of five.